The Chapman collection in particular includes a wide variety of photographic objects – film negatives of different sizes, prints of different size and date, colour transparencies and cine film (which was not included in this project which considers only still photography). The collection, however, acquired these multiple performances over a number of years reflecting the reproduction of images through publication and exchange. 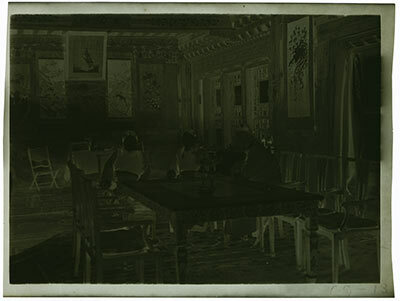 Many prints have extensive photo-editorial comments and markings on their backs, which have also been presented on the website because of their significance to the methodology of research. In this case, therefore, there was a need to develop a research methodology that would assist in identifying which photographs had been taken by Chapman and which by other members of the Mission (such as Nepean and Philip Neame), what the photographs were of and when they were taken. In this way the history of image taking on the mission had to be explored in considerable detail. The slide shows the range of inscriptions and other markings that were critical to identifying images in these ways. 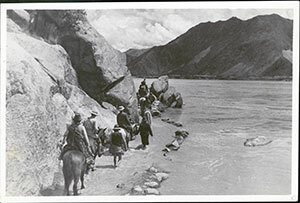 The top right image shows the reverse of the scene on the left of the Mission part progressing along a flooded path en route to Lhasa. These markings have been added by a photo editor, possibly from the publisher Chatto & Windus. In this case there is also a caption, but there are also a number of other inscriptions including in the top right corner the reference ‘CHA’. The significance of these markings became clear during the research. The negatives for 1998.131.483 demonstrate the kind of marks that were helpful in identifying negatives for which there was no print. The negative on the left has the number ’13’ scratched into the corner, the negative on the right has the number ‘1’ printed on it. This was from a film pack, all the negatives of which would be numbered according to the number of negatives in the pack. It was possible to identify Nepean’s negatives in the Chapman collection in this way as they had all had the inscription ‘YN’ plus a number scratched into the edge of the negative in a similar way to that of the negative on the left. Details about the photographs were gradually built up using a number of textual and other sources. Critical in the process was the discovery in the Pitt Rivers Museum Manuscripts Collection of the original handlists of negative rolls and film packs that Chapman compiled whilst in Lhasa. Another key textual source was the official Mission Diary in which many photographs were published. However, it was not assumed that images published were inevitably taken on the day which they illustrated as it became clear that images were not date specific in this way. 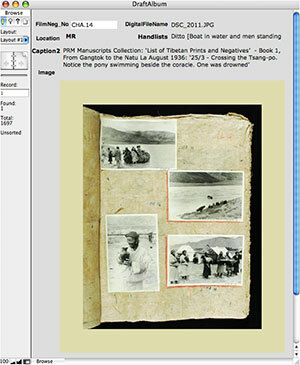 We were also fortunate to have on loan in the museum copies of the photographs in the form of the albums compiled in Lhasa from a private collection and these helped to corroborate the research findings. Limited access to these materials have been made on this website with the owner’s permission with the express intent of demonstrating this aspect of the research methodology. The way that information was gradually built up around images can be demonstrated using the print seen previously identified by the reference ‘CHA’. First, a database was created of Chapman’s handlist (top right of slide), with each image being given its own record, whether or not it was in the PRM’s collections. 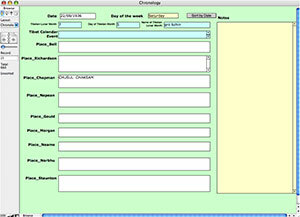 The critical field was the film roll and image number recorded in the ‘Previous Other Number’ field. ‘CHA’ in this case was the reference given to a film roll and the image also had an individual number identifier, in this case ’14’ so the field in this record had the reference ‘CHA.14’. A second database was developed from the loan material so that each photograph in this material also had its own record (bottom left). 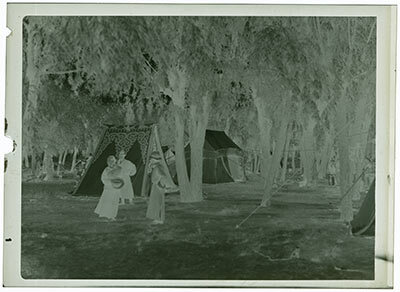 The two databases were related through the number reference field as described as the loan material also gave similar identifications for each image. This information was then imported into the handlist database as a cross-reference and check on the data. A third database was then created from the Mission Diary in which a record was made for each day and the location of the various mission members was identified. The value of this will be explained below. When all this information had been collated it was then possible to transfer it to the main database for the relevant collection. Here one can see how the information about the image ‘CHA.14’ has been built up and related. 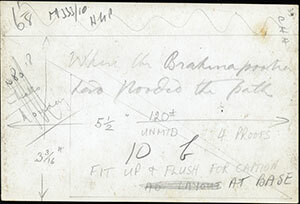 The database details the film roll number, the place and date on which the image was taken and the photographer. In this way it became possible to identify not only who had taken each photograph, but with a great deal of precision, where and when.